Points are tallied from Thursday and Friday to set the grid for the main event for Saturday night’s $30,000-to-win main event. Each night during the Show-Me 100 weekend is equally important as a result. However, after winning the previous night, Scott Bloomquist found himself climbing out of a hole early on Friday night. The Team Zero failed to make it to the track for qualifying. That regulated him to the back of the heat race. He started 11th in the third heat race of the night on Friday. He was able to climb to 7th at the conclusion of heat three. That placed Bloomquist 7th on the starting grid for second of three B Mains. They only took the top 2 in each LCQ to the main event. Provisionals are not given on the preliminary nights in the Show-Me 100. Even if you won the previous night, you still have to race your way in on Friday. The Thursday main event winner had to battle to the front. He did just that and erupted the grandstands in the process. They dropped the green flag on B Main 2 and Bloomquist was on the charge to the front immediately. By lap 7, he found himself sitting in 4th while Jimmy Mars and Shannon Babb raced side by side for the final transfer spot just ahead of him. 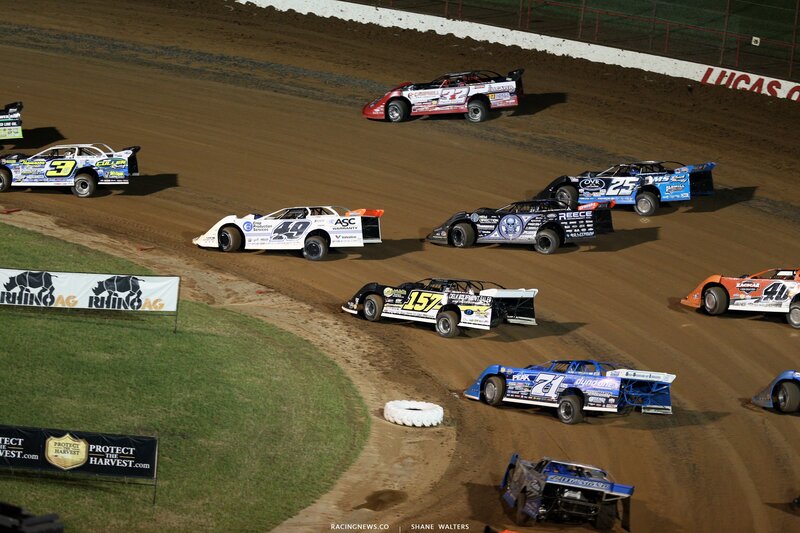 As they raced side by side, Bloomquist was on coming quick and he had the whole race track to form a run. Heading into turn 3, Bloomquist shot to the middle between Mars on the bottom and Babb up top. As they came off turn 4 at Lucas Oil Speedway, they were still 3 wide. However, the straights are narrow in Wheatland, they ran out of room in a hurry. Mars came up into Bloomquist, they banged wheels. That jolted Bloomquist into Babb. They all continued into turn 1. As they exited turn 2, Mars was still under Bloomquist. However, the right front broke. The car went dead right and he clipped the left rear of Bloomquist. The #0 car got sideways but he saved it. Mars however, made light contact with the back stretch wall as he jumped completely out of the throttle to avoid the concrete. Mars slowed down the back and the caution came out. 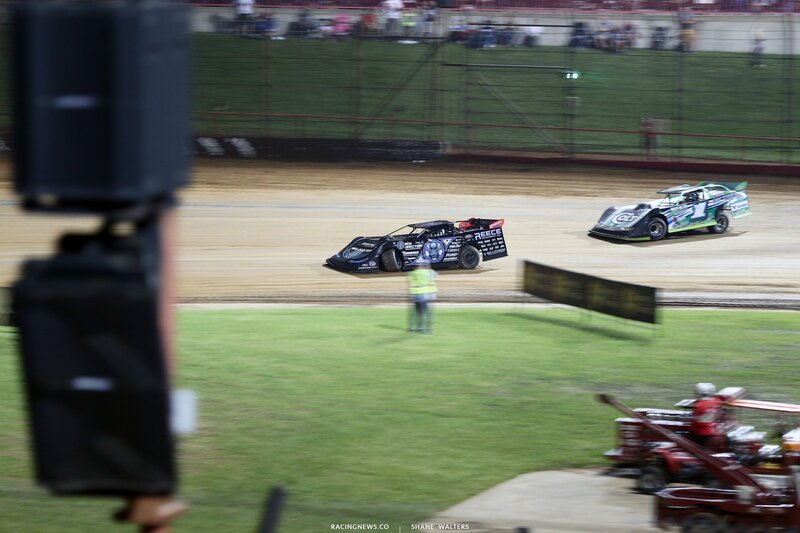 Under caution, Mars pulled alongside Bloomquist as the two drivers signaled each other about what just happened. As they went back green, Bloomquist was running second. However, the left front wheel of Bloomquist had major issues. The #0 machine had damage as well, the left front wheel was locked all the way to the left. It wasn’t rolling, it was just dragging along as it folded in behind the drivers side door. However, Bloomquist was still in second and he wasn’t going to just pull off the race track. As they went green, Richards jumped the cushion in turn 3. Bloomquist rolled the bottom and drove to the lead on 3 wheels. The crowd erupted. Several cautions later, Bloomquist was able to hold on, drive away and take the win in B Main 2. Today, I asked Jimmy Mars about that incident. He and his crew had the right front off the car as they repaired both side of the front end. hours ahead of the final night at Lucas Oil Speedway. How damaged is your car? “Just the front end,” Jimmy Mars stated to RacingNews.co on Saturday afternoon. What did you think happened there? “I got run over,” Mars was brief. Did you know you were 3 wide though? “Well, it’s hard to tell you’re 3 wide when a guy’s on the back side of ya,” Mars continued his side of what happened. After the B Main finish, Bloomquist had about 15 minutes to repair the left front of the car. As the 10 minute warning horn blew, bent bars were still being removed on #0 and Bloomquist was grinding on a replacement tire. The crew had it jacked up and worked in a rush. Replacing all kinds of parts, they made it to the grid. However, it was only a bandage repair. Moments later, Bloomquist started 20th in the A Main. Three wide and in the middle, he drove all the way to 3rd and finished on the podium. “One of our boys dug us in a hole here earlier. That’s what got us put in the back. We just had to fight an uphill battle all night,” Bloomquist stated from the podium. “We were up for it. But still, it’s hard on the car and hard on myself,” Bloomquist says with a laugh. Bloomquist is a four time winner of the Show-Me 100 event at Lucas Oil Speedway. However, his last win came 10 years ago at the 2008 event. Scott Bloomquist will start tonight’s Show-Me 100 main event from the pole position. Jimmy Mars will start on the pole in B Main number 2. The top two from that event will transfer into the Show-Me 100.